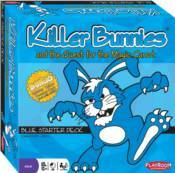 Killer Bunnies Quest Blue Starter Deck will take you on the Quest for the Magic Carrot in this hilarious and fun filled game. Can you escape the smothering impact of the deadly Fluorine Gas or the devastating damage caused by the Stray Asteroid? It�s off the wall strategic fun, where the goal is to survive and claim the Magic Carrot to win the game. Game includes 165 large cards, 36 small cards, 6 twelve-side dice and instructions. For 2 to 6 Players, 90 Minute Playing Time, Ages 12 to Adult.